Cavalier is a set of miniature wargame rules for fighting large skirmishes from the age of pike and shot covering the period from the mid 16th century to the late 17th century. 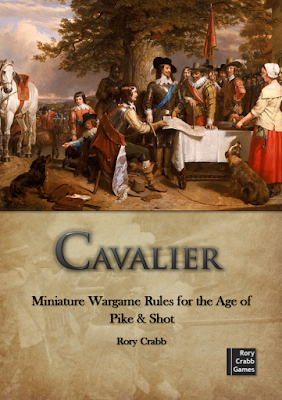 The rules can be used to play battles from any of the many conflicts of this war-torn period such as the Italian Wars, the Thirty Years War and the English Civil Wars. The game has been designed with 28mm miniatures in mind however there is the flexibility to use any scale with any system of basing. Games will usually involve small forces of 30 to 100 men or horse and can be played in a few hours. Standardised stats are included for unit types of the period giving players the flexibility to build any unit they wish be it fictional or historical.